For the last few years the Mums Mail High Tea has been a highlight on my social calendar. Well, considering how bleak my social calendar looks you may think that that is not saying too much. Trust me – I am not alone in my enthusiasm for this event. I was seriously excited/honoured/chuffed to be featured in “A Daft Scots Lass” blog yesterday.All the usual suspects were there – The Alien, Chicken Man, The Furry 4 and Ama Glug Glug Wine Club. I seem to have been out and about quite a bit lately what with networking functions, client appointments, wine club and book launches. This is a good thing as it gives my failing eyesight a break from staring at my computer screen. 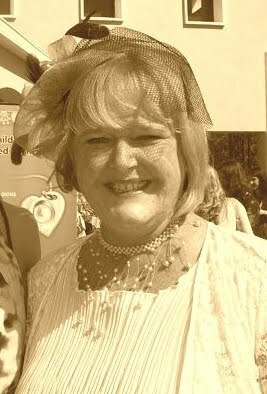 On Friday I attended the much anticipated Sunflower Fund/ Mums Mail Very Vintage High Tea. The ladies really pull out all the stops to dress up for this event. I am not a great theme dresser-upper but the theme afforded me the opportunity to wear my wedding dress again. My bit for recycling done for the year. As always – great entertainment, good food, seriously impressive lucky draw prizes (no, I did not win) and the best goody bag ever. Well done to Alice Leah and the Mums Mail team. 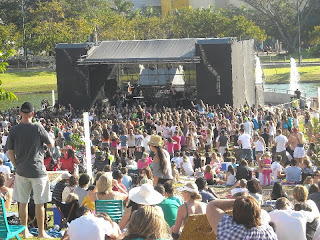 On Sunday I went to a concert. A concert for teenager types. What was I thinking?! If the Alien ever says I don’t do anything for her, I shall remind her about this concert. A band called Goodluck was opening for the main act which was Locnville – those young lads with freakishly deep voices. It was at the Chris Saunders Park in Umhlanga which Chicken Man did not even know existed. He needs to get out more often, clearly. After cussing and cursing in a queue for over an hour thanks to poor organisation at the gates – we finally got in to the park. Although a group of some of my favourite friends were there, we selfishly pitched our camper chairs as far away from the stage as possible. I was hoping the volume would be softer there. That didn’t really happen. But what did happen is that Chicken Man and I had a wonderful afternoon in the sun together, sipping liquid refreshments and munching on the picnic items I had packed, whilst watching the passing parade of today’s youth. The Alien and her friend only appeared when nourishment was required. It made me realise just how little quality time Chicken Man and I have together. A problem that I am sure a lot of busy, modern day couples face? Most weekends he is taking countless phone calls and stressing out about trucks, deliveries and blah blah and usually ends up going into the office. I am always listening with half an ear as I continue working on my laptop. No phones and no laptop. No talking about chickens or social media. Just 2 relaxed old folks enjoying surprisingly good music amongst the shorts and shiny locks of the energetic, bright-eyed Goodluck and Locnville fans. Have I mentioned that I love reading? No? How remiss of me. Books have been to blame for many a sleepless night as I force my eyelids open and coerce my eyes to focus so that I can read one more chapter… then just another chapter…one more….and so it goes until it is 3:00am and I have finished the book. Sound familiar? I bet it does. As much as I enjoy reading all the great best-selling international novelists like Stieg Larsson, Dan Brown, Jodi Picoult, Dean Koontz etc – I do so love reading South African novels. It’s refreshing to be able to identify with the places, people, humour and idiosyncrasies that are uniquely South African. South Africa has some great writers and here in Durban North, to compensate for the shocking drivers, we have Books & Books. A delightful book store which regularly host some of our South African authors. 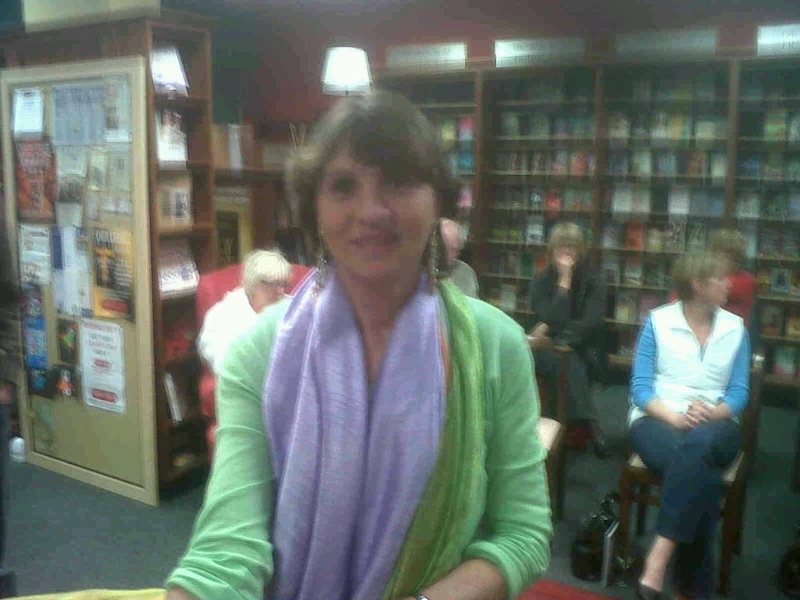 I went there to listen to Jenny Hobbs, author of “Kitchen Boy”, whose talk was fascinating as she and guests alike shared details of what South Africans went through during World War 2. 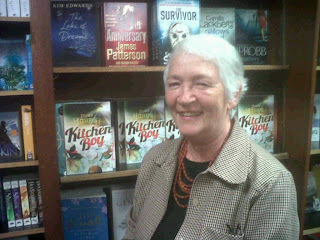 Kitchen Boy was an amazing read, made even more special with references to familiar spots within KwaZulu-Natal and Durban. I just loved the “Ants” books so jumped at the chance to meet Annica Foxcroft. She was promoting the 3rd in her Ants series namely “Ants in the Big Onion.” Her previous 2 books – “There are Ants in my Sugar” and “More Ants!” were books that one could easily read in a couple of days and which had you smiling the whole way through. Annica was an eloquent and amusing speaker whose love for the written word clearly extends to the spoken word. Although I had already met Di Smith, I wanted to hear all about her new book – “You’re Awesome.” I purchased her book not for myself – but for The Alien. The positive messages in her book are just what a teenager needs to empower themselves to get through the unimaginably difficult world they live in. 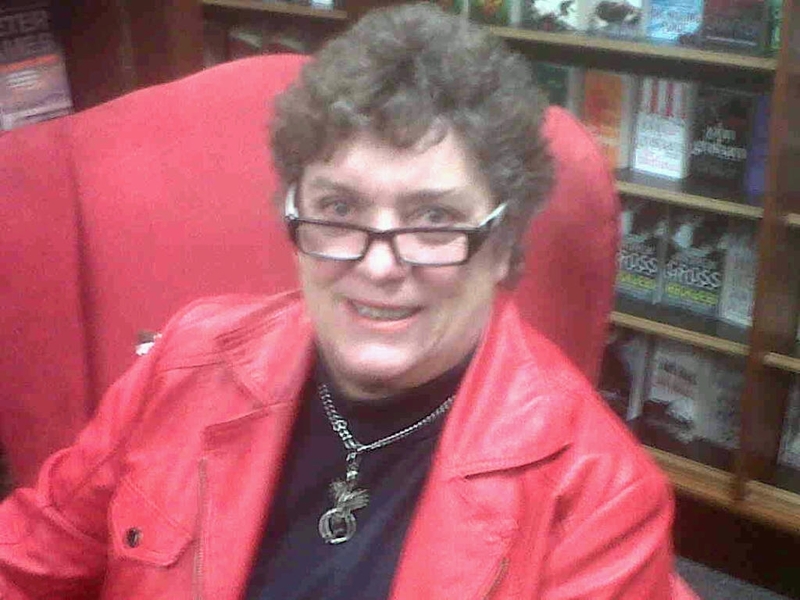 I am looking forward to hearing Mandy Weiner whose book, “Killing Kebble”, has attracted a lot of publicity. It is definitely not a book that you can put down and pick up at whim. There are so many characters and story lines that it demands you pay attention. Mmm, I may have to borrow one of the Aliens Ritalin tablets. Any more South African writers you can recommend? My fellow Ama Glug- Glugger, Lesmarie, gave me the book “Mushy Peas on Toast” by Laurian Clemence. Looks like just the type of book I want to read. Loud and proud – it’s South African. Posted on August 11, 2011 Author AlmaCategories events6 Comments on Books are Lekker, né? The idea of getting up at 4:45am to pack and get to Gateway by 6:45am did not blow my hair back but believe you me, it was all worth it. I had been invited by Carol of Personal Touch to join a group of event and conference organisors to attend a site inspection trip in Zululand. On the trip up on a luxury coach, we all got to know each other. There were about 28 of us – strangers faced with spending the next few days together. It became apparent that there was nothing strange about any of these folk. What a great bunch! The next 3 days went by in a haze of teambuilding, stunning venues, activities, wild animals, delicious food and memorable experiences. At Ghost Mountain Inn the staff were so warm, knowledgeable and helpful we felt that we were leaving friends behind when we finally departed. A drive up the Ubombo Mountains through the local Zulu community, followed by drinks and snacks overlooking Jozini Dam once we reached the top, was fantastic. The boat trip on the Jozini Dam the next day was …umm…very wet. It poured with rain. Spotting hippos popping their heads out the dam and wriggling their ears at us made our sodden state worthwhile though. I am not keen on seeing animals in captivity but at Zulu Croc I could see that the snakes and crocodiles were well looked after and happy. The guides crammed us with fascinating facts. That reminds me, I still need to check if Vine snakes ever hang out in Durban North. I felt relaxed the minute I arrived at Amorello Bush Golf Lodge. Could have been the yummy cocktail but I think it was the warm, close to nature ambiance that the place exudes. Although we were all pretty bushed after all our gallivanting about and early mornings, a good few of us partied till late, getting to meet some locals who frequent Amorello for its well stocked pub and pizza oven. Considering the bleary eyes the next day – it was a good thing that it started with a look at Amorello’s eye-opening Ihlozi Private Lodge. I can but dream of spending a weekend there one day when I grow up! Let me fill you in here that our itinerary had changed because there was a newly graded road causing problems getting to Bayete Zulu. Our trip there had therefore been delayed so we were looking forward to seeing our last site. Probably 500 metres from our destination the mud got the better of our gallant driver who, after numerous attempts to get the coach through the slippery mud, had to concede defeat. We were picked up by Land Rovers but not after some of us had squished through the mud. The Elephant Interaction that awaited us ensured we forgot about the mud in-between our toes as we touched, fed and talked to the elephants. Rambo, Rachael and their baby Jabulani had us all mesmerised. The vast, open view from the stunning 4-Star Bayete Zulu was our backdrop for lunch. I was impressed by what Bayete Zulu offers to accommodate families with children considering its 4 –star opulence. We arrived back in Durban a weary but happy group of friends. To coin a much used phrase during the tour…..Viva! Viva Carol van Niekerk and Shaun Visser and all the individuals who made the tour so special. Viva Zululand and the beautiful Elephant Coast of KZN. Viva to making new friend. Viva! I have always enjoyed attending conferences. The ones I have attended have always been interesting, a good excuse for doing no work and generally result in a huge “all fall down” party afterwards. When I worked at Vital Health Foods the highlight of the year was the annual conference. 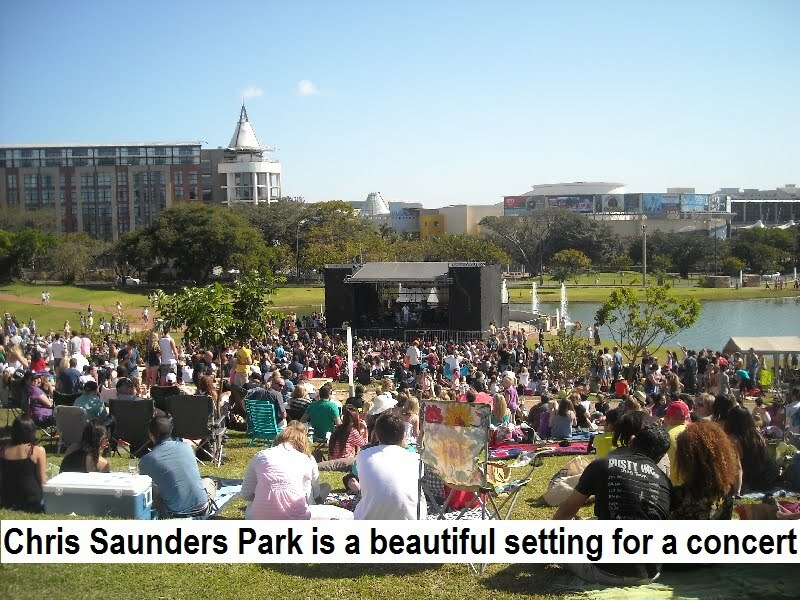 It was always held at an amazing location and the evening activities were great fun. Sales reps are generally party animals even if they sell health products by day. By night, all thoughts of liver damage and depleted vitamin levels are expelled. Of course this meant that the conference room was filled with red eyed, incoherent zombies the next day. A small price to pay for excellent company camaraderie? I recall a conference during my tenure with Fedics Food Services. After lunch most of the delegates seemed distracted and no-one was really paying attention. The poor speaker probably wished that they had allowed alcohol to be served with the lunch. Delegates then started to turn pink with spots and many excused themselves to hurriedly head for the loos. Well, as it turned out a whole bunch of us had food poisoning. Can you picture the scene? 3 Kombi loads of catering personnel arriving at the local hospital suffering from food poisoning! The hospital staff were highly amused. We all thankfully managed to regain our strength and the ability to hold down alcoholic beverages in time for the evening activities. Oh, just to clarify – Fedics were NOT doing the catering that resulted in its management team fighting over Kombi windows en route to hospital. My latest conference experience was very different as it was a public conference and I was one of the speakers. Sure, there are people who do training and speaking as a profession so may be exempt, but anyone else who has to talk to 350 people and say that they are not nervous is either lying or delusional! There were some really interesting and inspiring speakers prior to my slot but I found it quite difficult to concentrate. My clammy hands and thoughts of totally stuffing up my presentation made paying attention difficult. I survived the ordeal unscathed and must admit to actually enjoying the experience even if I felt like a “rabbit in the headlights” with the bright lights blinding my ability to see whether the audience had nodded off or not. I do not envy conference organisors. A lot of PR students see this part of the profession as glamorous and exciting. I don’t think they realise the hard work that goes into a well run conference. So, well done and thank you to the organisers of the eThekwini Women Empowerment 2 day conference. Nelisa Kala, a DJ at East Coast Radio, did a fantastic job as programme director. 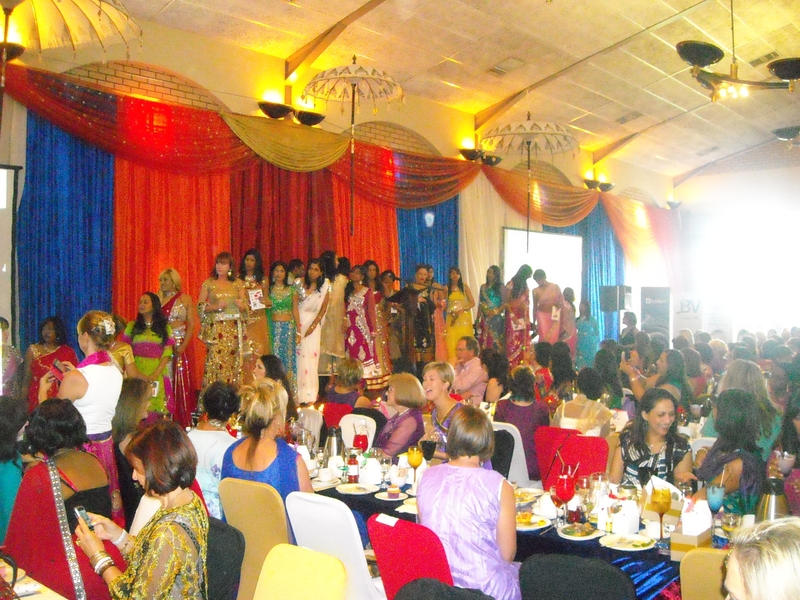 The Durban ICC runs like a well oiled machine and the ThoughtFire team and eThekwini Business Support and Markets Unit management ensured that all the women who attended had an inspiring, enlightening and enjoyable experience. 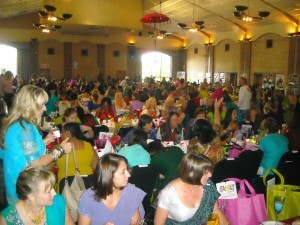 The conference culminated with a gala banquet. I managed to persuade Chicken Man to accompany me. He is generally reluctant to don a tie and jacket but seen as he had some practise the week before thanks to the Durban July, he agreed to attend without too much arm twisting and bribery. Yet again, the activities were well organised and varied. From dancers and singers to videos and guest speakers. I enjoyed listening to Devi Sankree-Govender talking about her journey to Carte Blanche. Her great sense of humour comes through in her Sunday Times column but it was pleasing to hear that her humour is genuine and her success and popularity is well deserved. It is a shame that a lot of companies are cutting back on conferences. A conference does not have to be all glitz and glamour and big bucks. It just needs to be an opportunity for staff to catch up and to bond and be able to leave with a sense of pride and loyalty in their company. The main requisite for a successful company conference is a huge booze budget and hangover cures washed down with Red Bulls with breakfast.